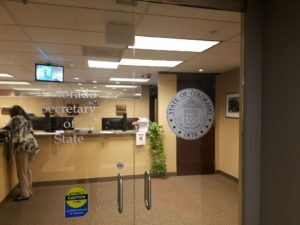 Colorado Secretary of State Wayne Williams issued temporary rules yesterday explaining how to file complaints about possible violations of Colorado’s campaign finance and disclosure laws. Williams’ new procedures won’t scare off citizens from filing complaints, because the required form is straight-forward, logical, and easy to file. This post will lead you through process, in a step-by-step fashion, from filling out the required complaint to delivering it and waiting for a response. Watch for follow-up posts with new developments as they emerge. STEP TWO: Answer the questions on the Colorado Secretary of State’s “Campaign Finance Complaint Cover Sheet,” which you can find here. It asks for the name and contact information of the person “filing the complaint” and the person “alleged to have committed the violation.” Then you’re asked to “briefly summarize the allegations made in the attached complaint,” making sure to “allege specific facts to support a legal and factual basis for the complaint.” Easy Peasy. Colorado Treasurer Walker Stapleton, who’s running for governor, failed to disclose $30,000 paid to his wife, Jenna Stapleton, for her job as “Executive Director” of the Harmes C. Fishback Foundation, which is Stapleton’s family’s foundation. Under the Fair Campaign Practices Act (§ 1-45-110. Candidate affidavit – disclosure statement), Colorado law requires candidates for state offices to file a personal finance disclosure form with the secretary of state, listing not only their income but also that of their spouses. (CO Rev Stat § 24-6-202 ). The form asks you to attach a “complaint.” I used essentially the same summary above and stapled it to the complaint cover sheet. I rode my bike up to the secretary of state’s office and delivered my complaint this morning, but you can also mail it in. Don’t forget to sign yours! STEP FOUR: Feel good about yourself. Even if your complaint is thrown out, at least you care enough about campaign laws to try to enforce them as best you can. You aren’t a loafer if you get involved. By the way, here’s why the SOS promulgated the new rules that have been explained in this blog post. Williams’ new procedures came in the wake of a federal court ruling last week that cast wide confusion over how–and if–Colorado’s campaign finance and disclosure laws would be enforced. Williams’ rules go a long way toward clarifying the matter, at least for now, experts say. That’s important given that the campaign season is upon us, and these laws need to be enforced. Under the new rules, adopted with consultation from the state’s Democratic and Republican parties and the Colorado Attorney General’s Office, elections officials will have 10 business days to make a decision on whether a campaign finance complaint is meritorious. If the complaint is rejected by the Colorado Secretary of State’s Office, the person who filed the allegation can appeal. There is also a process under which a flawed complaint can be fixed by whomever filed. If a complaint is reviewed and found to have merit, it will be forwarded to an administrative law judge — as was the process before. 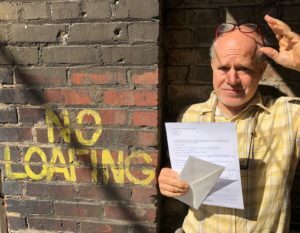 It appears that the Stapleton complaint used in this blog post to illustrate the new procedures was the first submitted since the new rules were announced. Again, I’ll write follow-up blog posts explaining how it goes. Wait a minute. YOU filed the complaint, Jason? And you're pretending it's journalism?? He did it because he's quaking in his boots over Cynthia Coffman. It's a real campaign finance violation that Stapleton's campaign committed. So Jason filed a real complaint. I think Jason's doing a public service. What's the problem? Stumbleton's (to use the moniker Republicans have given him) lax attitude regarding financial filings (remember his missing blind trust?) might explain his reluctance to provide his tax returns (assuming he has them to share). it's explaining the new rules using an example everyone can understand. that's journalism, yes.